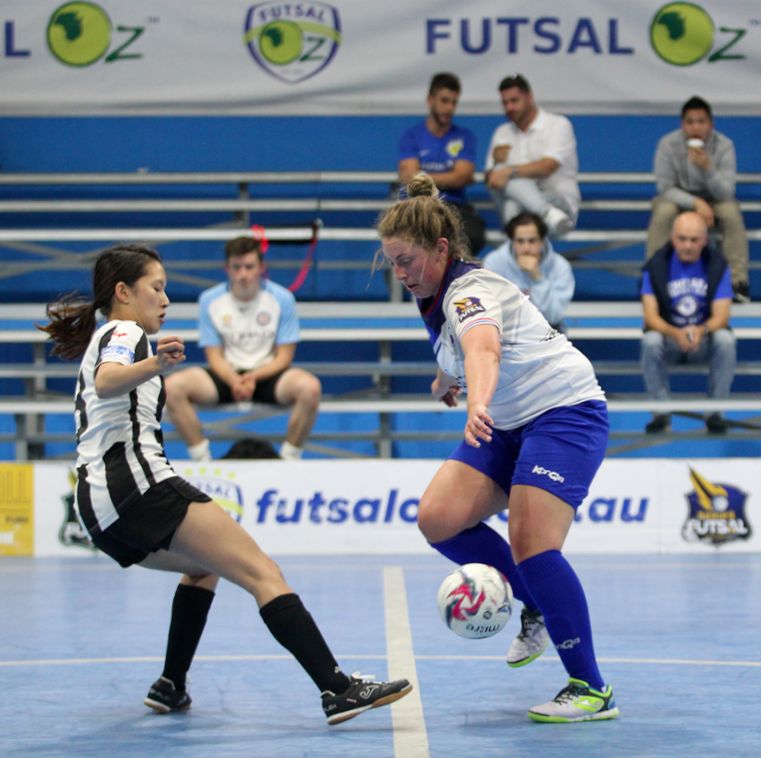 The opening game of the Womens Futsal Oz Cup top division saw 3rd placed Carlton take on sixth placed Pascoe Vale. With both sides having close encounters all throughout the season, this one was no different as both sides had a few good chances but neither found the net as we went into the break level at nil. The second half saw a bit of life breathed into the game and after a shot hit the post from Bruna Silva, Carlton managed to counter attack with Jess Byrne toe poking into the bottom corner to give the Heart the lead after 27 minutes. The lead didn’t last long with Byrne then putting the ball into her own net to bring the game back on level terms. Late on it would be Heartbreak for Carlton as a shot from Pascoe Vale’s Anita Caro was saved by Bitzilis only to be put home for a second own goal from Claudia Johns with what proved the critical goal as Pascoe Vale progress to the semi finals where they will meet Fitzroy, while Carlton crash out at the first hurdle which see’s their season come to an end. Our second Quarter Final saw Northcote take on Moreland for a chance to take on Champions Westside in the Semi Final. Northcote were well on top early on and a four goal to one opening half saw them build a solid lead with a brace from Claudia Dimasi helping set Northcote up for a win. Northcote again were too strong in the second half as they added a further five goals with Daniella Galluccio finishing with a hat trick, while Fresneda & Koranias both completed braces in a commanding win which saw Northcote safely through to the Semi Finals, and despite a hat trick from Jessica Au it wouldn’t be enough as Moreland’s season comes to an end while Northcote take on the Champions in Westside. 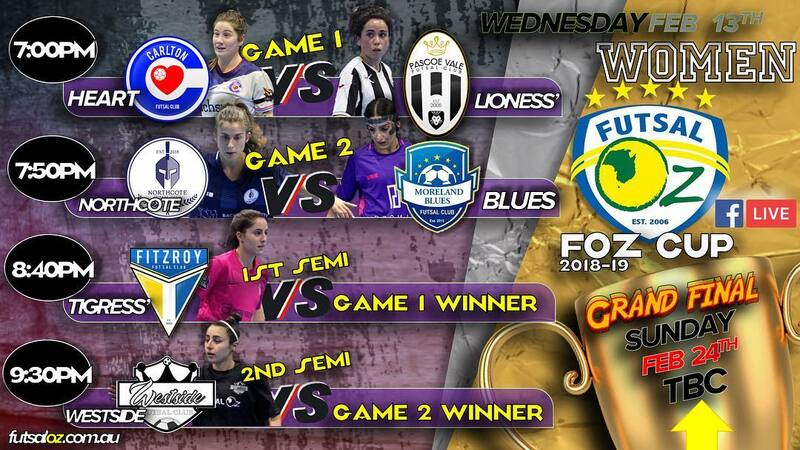 The first of the Semi Finals saw Fitzroy take on Pascoe Vale. In what is always a tight affair between the two, it was Pascoe Vale who got off to a lightning start with Abbey Flight bagging two very quick goals early on to give her side the lead. Fitzroy hit back through Em Coppock who finished her chance to halve the deficit and have her side in the game at the break. Early in the second half a counter attack from Pascoe Vale was finished off by Anita Caro to restore the two goal buffer. Fitzroy pulled another goal back from a corner as Romy Heasly headed home to keep her side in with a chance, but Pascoe answered back again with Caro finishing again to restore the two goal cushion. 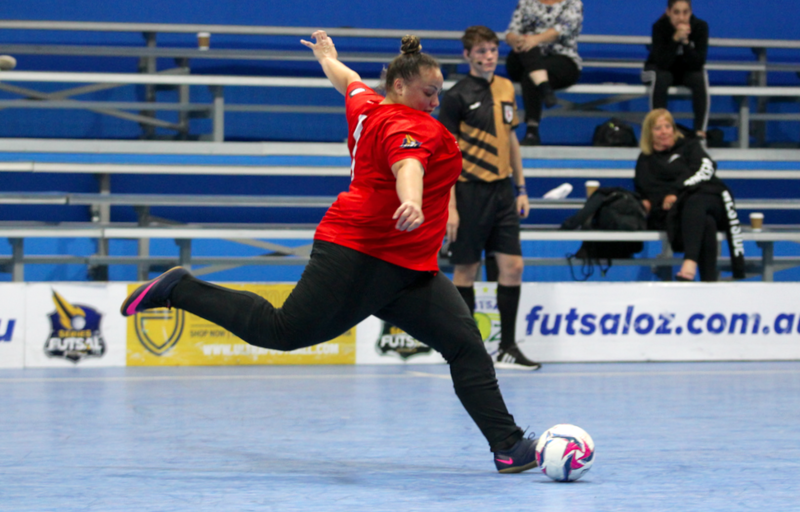 Flight would then confirm her hat trick to all but seal the win, and despite a late goal to Coppock it wouldn’t be enough as Pascoe progress to the final where they will meet Westside or Northcote. 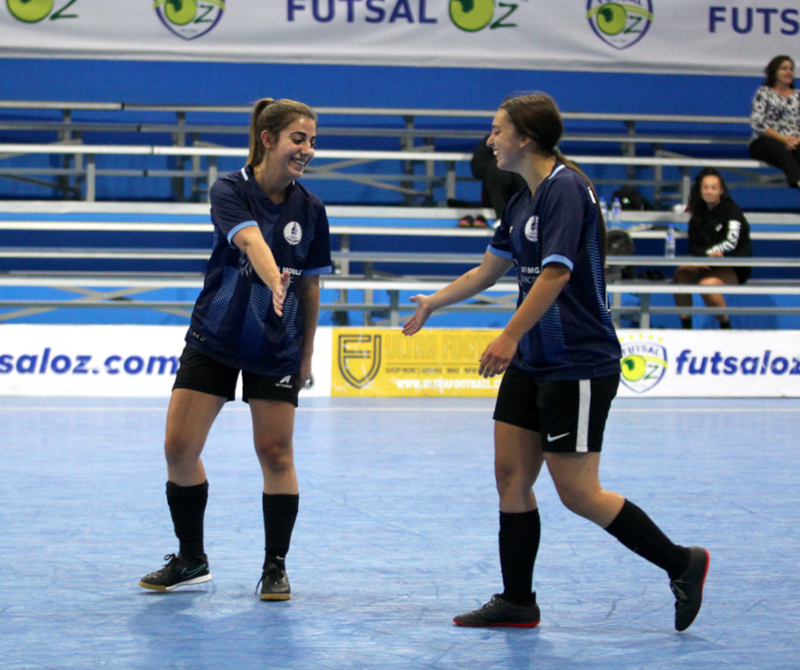 The final game of the night saw Westside take on Northcote for a place in the final of the Futsal Oz Cup. 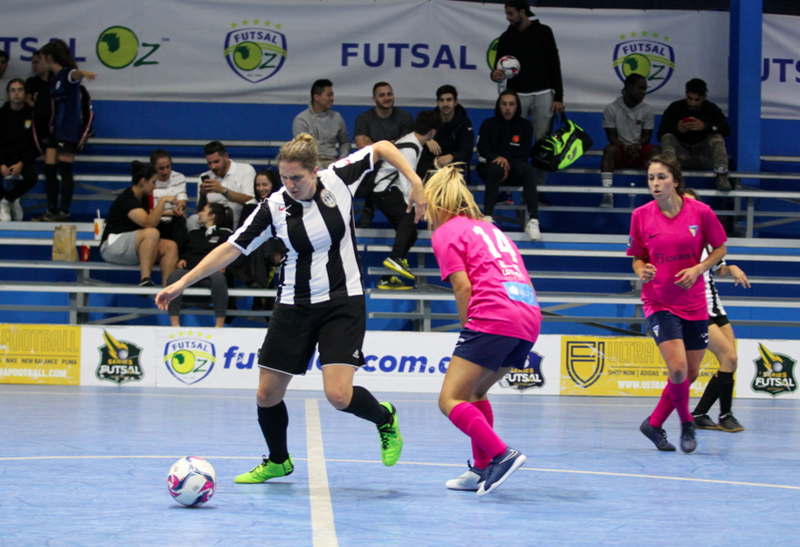 A pair of free kicks early on saw Christina Fonua strike twice to open up a two goal cushion, before a further three goals from Elly Torre, Caitlyn Storay & Pam Demetriou had the game all but over at the half time break. Northcote made a game of it in the second half with a brace from Candice Koranias steadying the ship but it wouldn’t be enough as a pair of bombs from Lisa Fonua sealed a commanding win for Westside as they take their place in the final where they will meet Pascoe Vale.